NOTE: This feature is only available on FreeStyle Quick Order Portal websites. Featured products is an easy solution to getting your selection of product previews to appear on the Home Page of your QOP website. 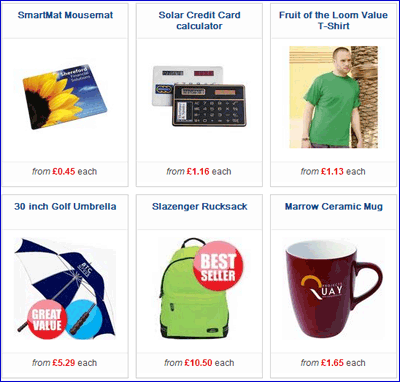 Suggested uses for this tool are; to show new products, special offer items, featured products etc. 3) Scroll down to the section called 'Featured Products'. Here you will see a drag and drop section. 4) To add products to the front page, they must already be in the Products section of QOP (either entered manually or uploaded via a data feed from PromoServe or Trade Only). Providing they are in the Product database, they will be searchable in this section. Enter a product code or description into the search field, or browse through the products by clicking next and back. Once you locate the product you want to feature on your home page, click on it (in the left list), and drag it to the orange list on the right. 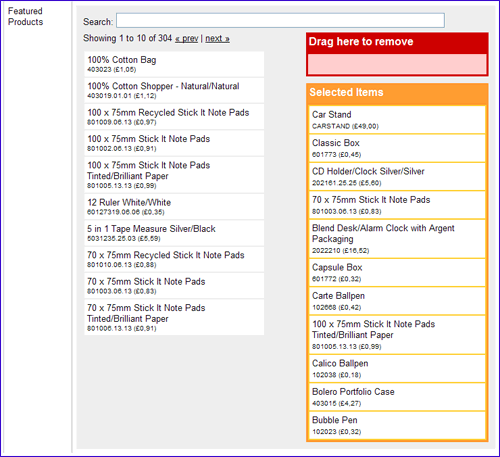 To remove any products, drag from the orange list to the red 'drag here to remove' box above. If you wish to arrange the products that are in the orange box, you can drag them up and down, which controls the order they appear on the home page. Once you are happy with your selection, click Save Changes at the bottom of the screen, the products will then become live on your home page. By default, the information that displays with each product is Price, Short Description, USP and Product Image. Using CSS you can define how this information displays, i.e. how many show across the page, which field of info show/hide, etc.